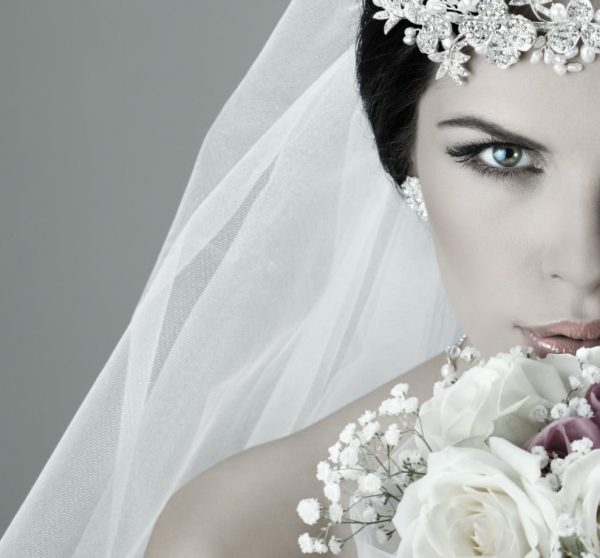 Nowadays, there are a plethora of stylish and cheap wedding cakes designs to choose from. 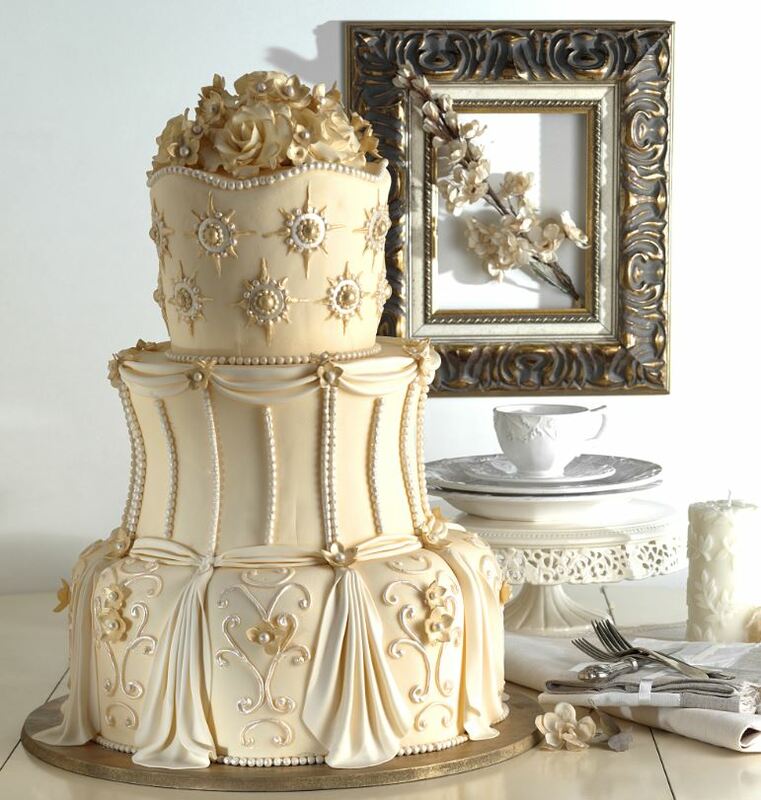 The art of designing cakes has evolved in such a way that cakes now look like masterpieces. This means you get to choose between thousands of cheap wedding cakes designs! 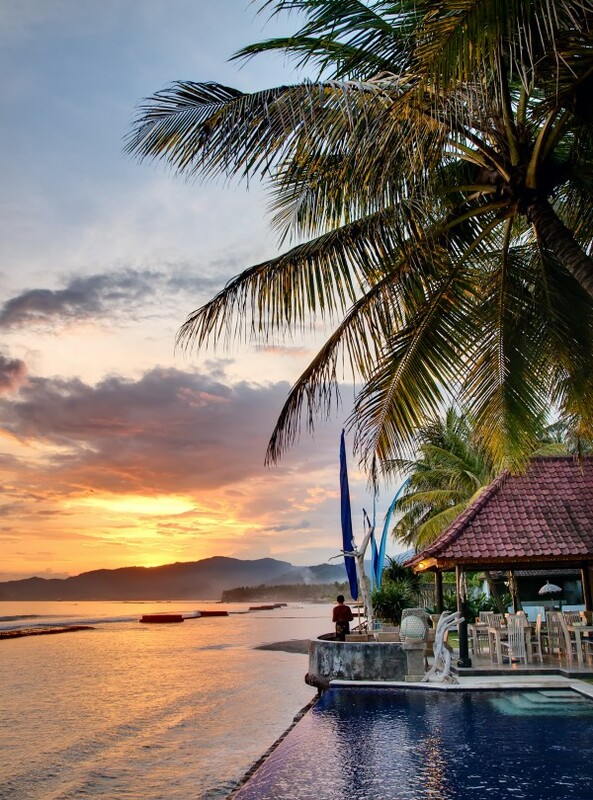 A long but wonderful and delicious journey before you find the one for you. In this post, I feature cakes with very distinctive designs. Have fun finding out which suits you better. 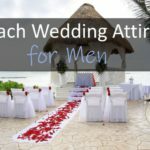 I will also provide useful tips to help you save money while still having a stunning wedding cake. 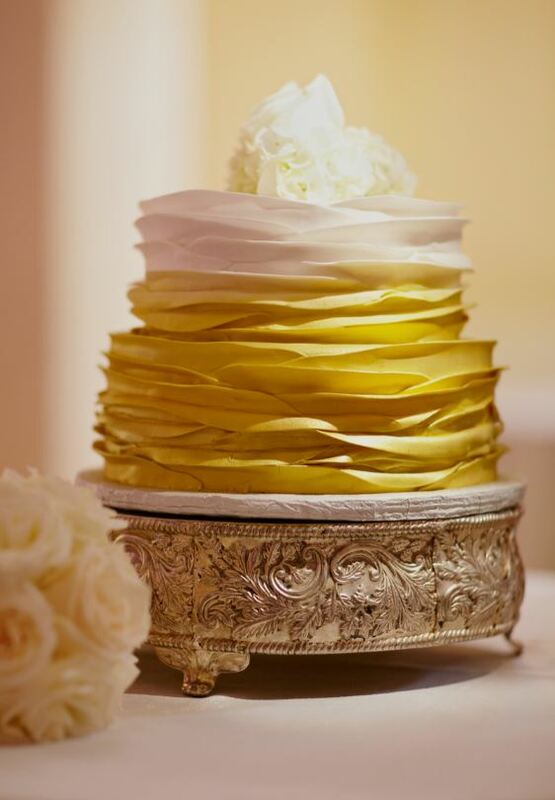 The traditional 3 layer wedding cake has been the most popular choice for years. Its height and number of layers can be personalized to infinity (or almost). It’s one option that can get very expensive as you will most likely pay more for labor to have it decorated than a single tier cake. 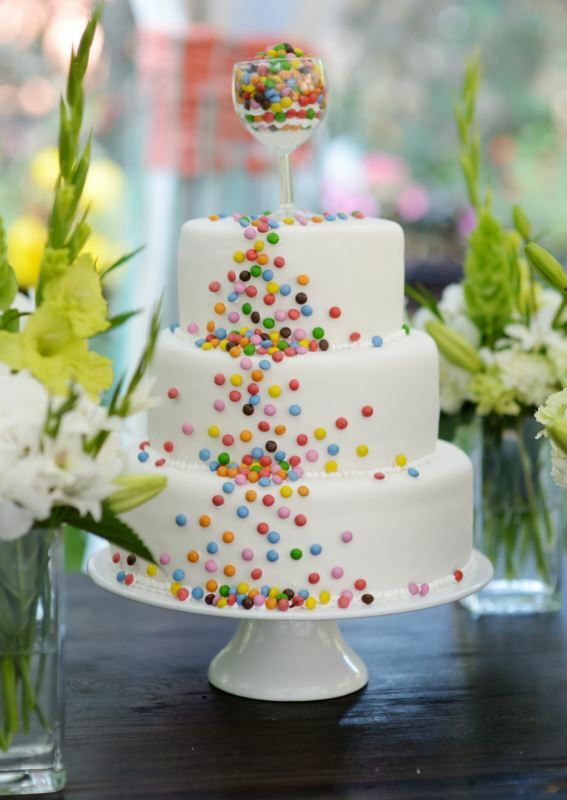 Let’s start off with a simple and delicate white fondant decorated cake adorned with candy. This cake is one inexpensive design that can be interesting if you want to keep the cost low. You could change the wine glass topper for any container you can think of. 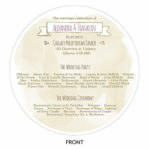 You can also go for a traditional bride and groom topper made with cookies (to keep it yummy!). The nice candy cascade surrounding it will look like a colorful confetti waterfall. If you want unusual or complex shapes added to the cake, you will pay more for the time the baker has to spend making them. Instead of having hand-made sugar flowers, decorate the cake with seasonal edibles like fruits and flowers or your favorite candy. Bakers are usually open to such suggestions. He will help you choose the best colors and shapes that will enhance the cakes aspect and make it look spectacular. Also, be careful as not all flowers are edible! Your baker should be able to point you in the right direction. This beautiful champagne tone cake is the ultimate refinement in terms of details. It’s an elegant and sophisticated representation of a bride’s gown. Although it will make all heads turn, it will also take a large bite of your budget. When it comes to saving on aesthetics matters, one has to be creative and receptive to different alternatives. What makes this cake expensive is baker’s labor. The bigger the cake the more time he has to spend molding and sculpting the drape-like shapes, adding sugar beads, and ornaments. If a complex and highly decorated cake is what you dream of, here’s how you can keep the cost low. Have a smaller cake that meets your decorating expectations and order side cakes (also called sheet cakes). These cakes are intended to complete the number of slices you need to feed everyone. They are not as heavily decorated as your dream cake but still look appetizing. Plus, the baker is using the same tasty flavor you’ve chosen to make all the sheet cakes. Not convinced that this cake style will look elegant enough? Start looking at the possible designs and you will see that a single-layer can be as impressive as a multi-tier cake. Baker’s can shape them into surprising highly sophisticated stuff like a bridal bouquet or intertwined wedding bands. If you and your future spouse share a passion for golf, music, traveling, etc. why not have your baker make a truly unique cake for you? Have him or her shape your cake into a golf ball, a treble clef or a palm tree. Add in your own personal touch like your names with your wedding date and you have a gorgeous wedding cake that closely reflects who you are. A single-tier cake is also the perfect option for a pastries buffet table. A dessert buffet will look grandiose with the cakes taking up the whole table instead of being concentrated in a specific place as a three-tier cake. The great thing about having a dessert buffet table is that you can have an amazing table at a low price. You can decorate the table with theme-related ornaments to fill the spaces between each dessert stands and displays. You will get a dramatic breathtaking effect even if you are only featuring 3 or 4 different dessert options! A simple and delicate ruffle design that appeals to the eye. Single-tier cakes can be nicely presented using different cake stands height to make them stand-out. You can also have them disposed in a circle very close to each other on a round table. It will give an opulent look to the table that will be seen from a distance. Mix it with other types of decorated cakes, pies, cookies, cupcakes and macarons for a colorful and textured table. 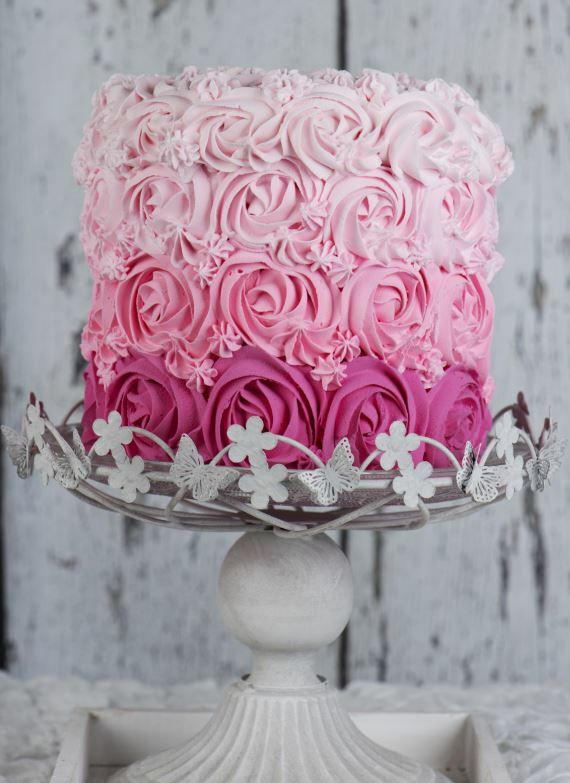 Here’s a simple and beautiful cake with pink sugar flowers. Another cute single-tier cake that’s perfect for a spring wedding. 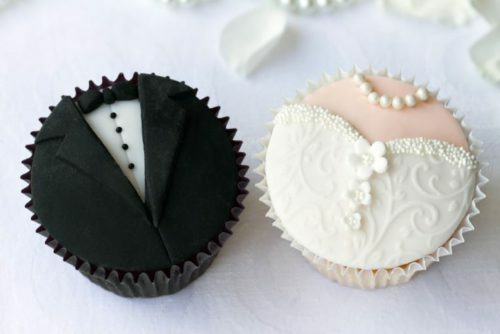 Cheap Wedding Cakes or Cupcakes? Cupcakes are wonderful alternatives to the traditional wedding cake. They are refined and can be exquisitely decorated as you can see in this picture. Cupcakes are a great option if you intend to make your wedding cake yourself with little baking experience. They are also fun to work with. You can group many of them to create a specific shape. If you want a three-dimensional design you can simply display them on a multi-level stand or secure them on some kind of support. 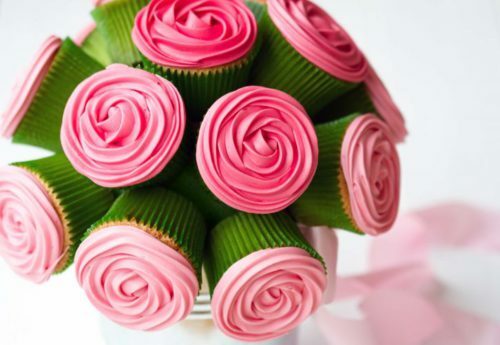 To make this spectacular bouquet, I suggest that you mix regular size cupcakes with medium and small ones. This will avoid having large gaps between the cupcakes. Once you’ve baked a bunch of chocolate cupcakes using this tasty recipe you are ready to make your bouquet design. Shape your foam cube into a ball shape. It doesn’t have to be perfectly round so don’t waste too much time on this part. In fact, don’t make it too round at the bottom to ensure the cupcakes that you’ll pin there hold well to the structure. Gravity really matters on any tri-dimension project. Attach your foam shape to some steady support so you can easily add your cupcakes. Make your cupcakes buttercream design before adding them to the ball. Yes, it will require some patience to ensure you don’t mess up the design while pining them. But it will be a lot trickier to design your cupcakes once they are settled on the ball. Here’s another important thing to keep in mind when adding your cupcakes. You should insert two toothpicks in the ball and then pin the cupcake through the toothpicks. One cupcake at the time. Also, pin the toothpicks in an angle that will allow the cupcakes located at the bottom to stay in place. Finally, once you’re done adding the cupcakes, fill the gaps with buttercream or leave as is as shown in the picture. How did you like the previously featured elegant cheap wedding cakes? Awesome or rather common, boring or insipid to reflect your vibrant couple’s personality? As I said before, cake designs are endless. You simply need to be open-minded to see the incredible diversity of techniques and looks that are available to you. Actually, you can even draw what you have in mind and bring it to a professional baker. A talented one will be more than happy to help you create the masterpiece you have designed. I hope you enjoyed this post. Feel free to leave a question, an opinion or just say hi. I will get back to you with an answer, a point of view, a salutation and a warm welcome if you’re a first-time visitor!